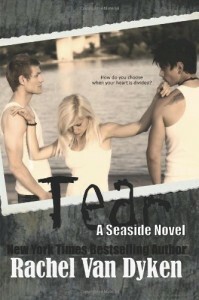 Before starting this review, I will disclaimer that I actually did want to read Tear before picking it up. I thought it looked like a fun possibility. It was not my intention to read this book and go on a ranting spree. Should I have quit sooner? Probably. But it was like being on a runaway train once I got started and I wanted to know where I was headed!If I had a running list of every single thing that I would not want to read in a romance book, I would have been able to check every single item off my list. Mild book spoilers ahead. You've been warned.The ABC's of What I Don't Want to Read in RomanceA is for Abstract. We were sort of dropped into this story without any real detail about the characters or setting. Natalee, the main character, was a shell of a person. Both of the two hot guys who were new in town fell for her. But WHY? We never got to know her as a character. And I don't think she got to know either of these brothers well enough to be thinking things like this :The problem was I loved Demetri too. In a totally different but very real way.I could also use A for the ever (not) popular 'Absent Parent Syndrome'. In the case of Natalle, she harped on how lackluster her life was by engaging in self-pity and using it to showcase an annoying presence of low self-esteem.Sometimes I think they wished I hadn't been born. "Why me, Demetri? You date movie stars. You date girls who look like supermodels. I guess I'm kind of confused.B is for Boy Band. Alec and Dimitri (the two new brothers in town) are in a group called AD2. Aside from the fact that Alec and Dimitri's names start with A and D and that there are 2 of them and this is a ridiculous group name...the fun doesn't stop there. "High School musical, Nat, really? ""It's good running music. ""So is the entire Hannah Montana soundtrack. Doesn't mean you put it on your playlist, Nat. ""The one who seduces girls on the dance floor and puts Justin Bieber to shame. "Yes, I got that they were joking around, but Nat also noted this : Alec grabbed a hat from some random guy and did this crazy Justin Bieber/Michael Jackson move that had people screaming until they were hoarse.And check out these song lyrics : Brown eyes, blond hair, I can't help but stare. She's got me hypnotized. I need her, like oxygen.Who exactly is the audience for this book? Tweens?C is for Clumsy - As in Bella Swan Style. Did I miss the note that this book was Twilight Fan Fiction? Natalee tripped, fell, ran into things, engaged in lots of pining, and made Twilight references. This isn't even about bagging on Twilight, but I can't figure out why this book had a weird Twi imitation going on. I dropped all my books to the floor. "Nat, you should really invest in lessons on how not to trip. "And the Twilight references...It was like, oh, gosh, I'm totally going to kill Stephenie Meyer and Twilight. It really was like breathing. Sorry Jacob and Bella, but it's true. "But I'm curious. Would I be more of a Jacob or an Edward? "C could also stand for Crack. Here's why.It was like crack to me.Having a guy say that was like crack for a girl.Closing thoughts :Two OMG HOT (according to the book at least...6'4" and muscle-packed happens at this high school) guys fall for a clumsy, nondescript girl who pities herself and can't stop rolling her eyes when someone compliments her. When one of the brothers cheats on her (after she'd been pining for the other brother), she gets to "mourn" him after their five minute (her words) relationship ends, to the point where she breaks down and hot brother number 2 scoops her up into his arms and carries her into the house like she was a helpless child. Does this sound ridiculous to anyone else, or is it just me?This chick struck me as being completely clueless and unable to put 2 and 2 together. When someone cheats blatantly, you forgive them almost instantly?I had a moment of thinking "good going, Sherlock" when I read this thought of Nat's : Apparently, just because a guy glares and has dark features, doesn't make him the bad guy. Just like dimples and an easy smile don't automatically make him an angel.Or what about this musing? I couldn't imagine the depth of despair it would be for a parent to lose a child, especially a teen parent. Excuse me? I'm pretty sure that ANY parent who loses a child would be devastated, regardless if they were a teen or an adult. If you're anything like me and would prefer not to read an ample helping of brooding, winking, smirking, smoldering, and all of the other emoting options which were present, then you'll get where I'm coming from.Who would I recommend this book to? If you want to live out the fantasy of having two hot musicians fighting over you, then this might be something you'd want to check out.